Back in the day when I started sewing, the dressmaker’s tracing paper available to home sewers was waxy, similar to professional waxed tracing paper. It made good marks, but they were permanent. The wax-free tracing paper commonly available to home sewers these days washes out better, but it barely marks fabric, it comes in small, thin sheets, it doesn’t last very long, and the marks often brush away before you are done with them. Because of these issues, I rarely use tracing paper for marking my garments. I usually use tailor’s tacks, washable markers*, or a chalk wheel* . However, there are times when I want to use tracing paper, such as when I trace patterns onto paper or mark the stitching lines on muslins. Since I can barely see the marks left by my wax-free tracing paper, I’ve been using the same raggedy strips of waxed tracing paper I’ve had for the last 25 years, but those little scraps aren’t going to last much longer. I’ve been meaning to get some professional tracing paper for a while, but it hasn’t made it to the top of my wish list yet. There’s always something else I need first, like some fabric, or a new pair of scissors, or another vintage sewing machine . . . I had just been thinking about the problems I have with tracing paper when I stumbled across the vintage patternmaking book Modern Pattern Design* by Harriet Pepin. You can also find pdf versions of this book online. The book begins with a list of tools and materials you need for patternmaking. The author describes how to make a “chalk board” (used like we use tracing paper to mark fabric) by painting a water/chalk mixture onto a paper surfaced board and covering it with cheesecloth. That got me wondering what sort of pigments I could use to make colored tracing paper. Maybe something waxy, like crayons? I decided to try washable crayons, since they can be dissolved in water and they wash out of fabric. Instead of using paper, I used a piece of quilter’s cotton. I figured fabric would hold up better than paper and would hold the pigment better. 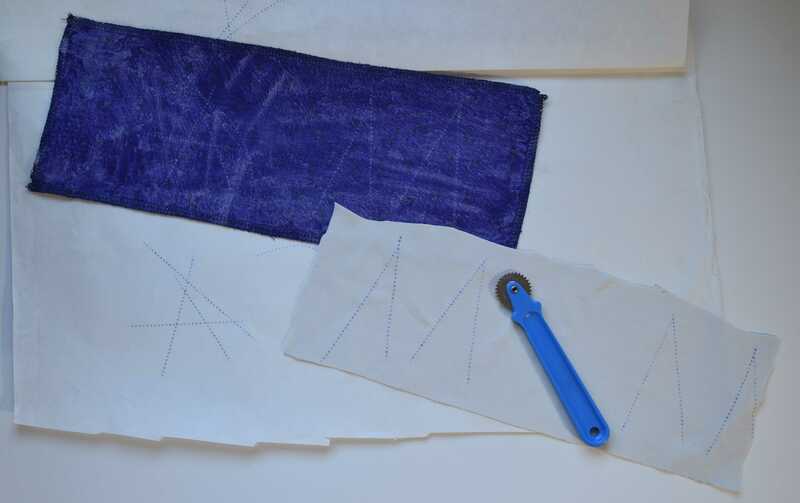 Also, by using fabric I could make a double-sided tracing cloth, so I could sandwich it between two layers of fabric to mark both layers at once. I asked my kids to get out their boxes of old crayons, and luckily they still had a few jumbo sized washable Crayola crayons left over from their toddler days. Crayola washable crayons* are made out of water-soluble polymers instead of wax. They dissolve easily in water and melt at a low temperature (don’t leave them in a hot car!). 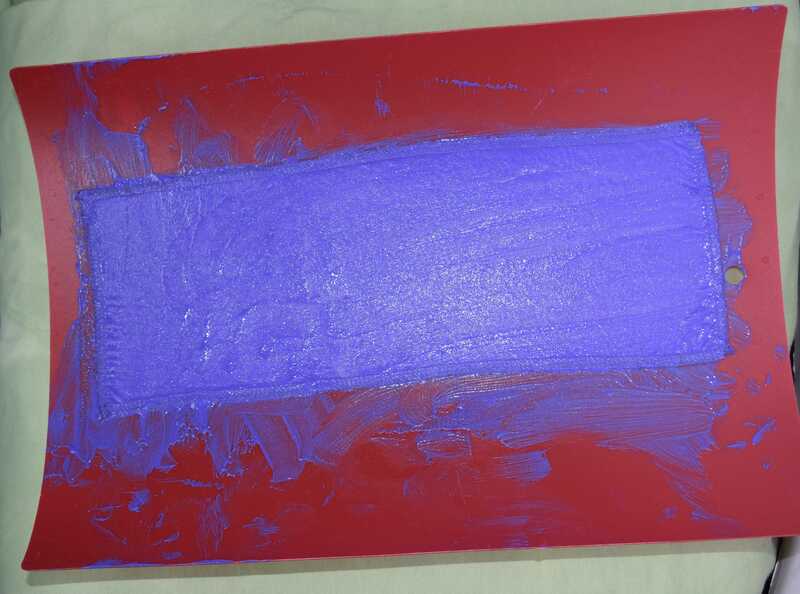 I chopped up half of a blue crayon and half of a purple crayon, added two tablespoons (30 mL) of water, then microwaved the mix 10 seconds at a time until I could stir it into a smooth mixture. This experiment reminded me of my high school science teacher. He frequently made fun of the wicked witch in The Wizard of Oz. He’d say “She was dissolving, not melting!” My washable crayons were simultaneously dissolving and melting, which is kind of unusual. The thick, slippery crayon mixture felt like finger paint. 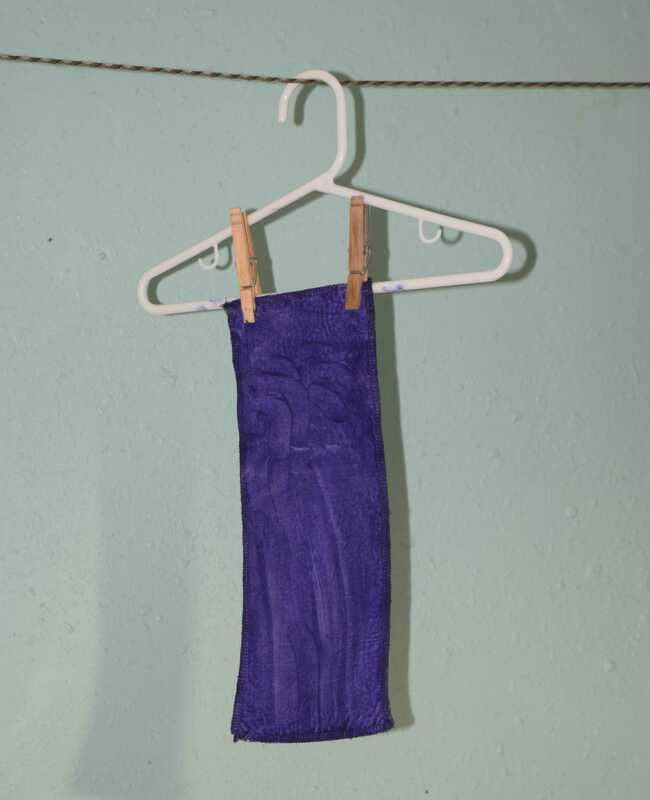 I got my 4.5″ by 12.5″ (11 cm by 32 cm) piece of fabric wet, wrung it out, and dunked it into the goop. I flattened out the fabric on a flexible cutting board and smoothed out the layer of crayon mixture. I had plenty of crayon mixture left over. I probably could have coated two pieces of fabric that size with the equivalent of one jumbo sized crayon. It was a bit messy, but cleanup was easy, because hey, it’s washable. I hung the fabric up to dry. After letting it dry for a day, I briefly ironed it between two sheets of paper with a barely warm iron, just to flatten it a bit. I was worried that the crayon would flake off of the surface and make a mess, but it doesn’t at all. The cloth just feels stiff, like oil cloth. And . . . it works! I tested it by tracing onto both paper and fabric. I sandwiched it between two layers of fabric, and got good marks on both layers. I’m still going to get some professional waxed tracing paper one of these days, but I think I’ll also get some more washable crayons and make a larger piece of tracing cloth. I can use my tracing cloth when I want marks that wash out, or when I want to mark two layers at once. The tracing cloth should last a really long time. When the cloth needs more pigment, I can always paint on a bit more washable crayon mixture to rejuvenate it. And I can make tracing cloths in lots of colors, too! I’m thinking a sewing notions company needs to team up with Crayola to make us some better washable dressmaker’s tracing paper! Absolutely brilliant! Thank you so much. I too have been using the last few scraps of tracing paper. Will buy some crayons and have fun. Oh. Em. Gee. My mind is blown. This might be one of the best sewing tips I’ve ever seen. EVER. Pure genius! And perfect timing– I just ran out of my own tattered scraps and was dreading having to deal with the new type. Now I don’t have to. (And with washability and unlimited sizing, this promises to be even *better* than the old stuff! Whaaat!) Thanks so much for sharing the idea!